We are a small brewery located in Holland, MI focusing on a variety of beer styles and experimentation. Our goal is to have something for everyone. We aim to be your neighborhood brewpub where locals and visitors alike can come together to share good beer with good people. Our name, Brewery 4 Two 4, originates from the last three digits of our north side Holland zip code. It reflects our intent to be a north side community gathering space. We have put an extensive amount of thought into every aspect of our brewery. From the glassware to our name, we want to provide the north side with an elevated beer experience when you walk through our doors. Expect to be greeted like a regular and to enjoy a top notch, community atmosphere at Brewery 4 Two 4. We hope you will explore the vast array of beer styles and experimental beers we plan to bring to you. Brewery 4 Two 4 is owned and operated by Dave Miller. You will see him around the brewery doing everything from brewing to taking out the trash. Dave originally hails from northern Michigan town of East Jordan. Dave his wife Erin, and son Desmond live on the north side of Holland. Dave has been in the area since beginning his undergraduate degree at Grand Valley State in 1998. His community ties grew substantially coaching high school basketball for 14 years locally. 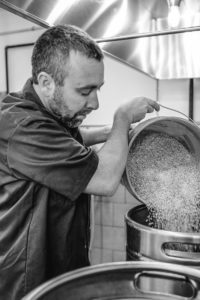 Dave has been homebrewing for well over ten years, starting humbly with a “More Beer” brew kit and a love for craft beer. The beer community has always been a part of Dave’s life for a long time. Previously, Dave brewed at Our Brewing Company in downtown Holland on the same system you will see at Brewery 4 Two 4. Opening a brewery was always something he hoped to do, but the reality was with a good, stable career and no money to open a brewery, it didn’t make a lot of sense. But after seven years of dreaming and planning, Dave went for it and Brewery 4 Two 4 was born. By cashing out retirement, every ounce of savings, and putting their home on the line, and not taking investor dollars, Dave was able to remain sole owner. Every dollar you spend stays with this business and this family. It’s been three years since Dave put it all on the line to make this brewery reality. So much blood, sweat, and beers have gone into the planning and execution of Brewery 4 Two 4. Dave and the rest of the Miller family are grateful for every customer and neighbor that comes in for a pint.